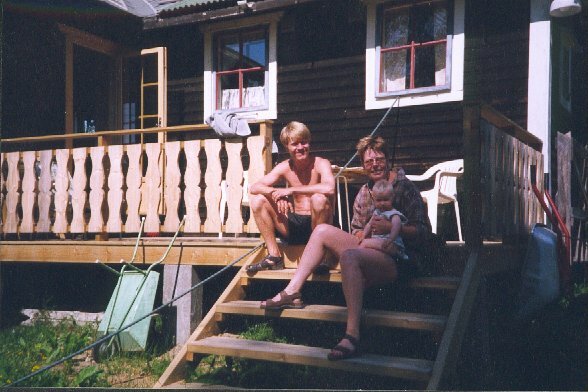 We have three cabins: “The Storehouse” (on pillars), “The Littlehouse”, and “The Yardhouse”. The Storehouse and the Littlehouse are old and charming buildings which are located within the frames of the Solhaug farm. Other buildings around the farmyard are the Pumphouse (with showers, WC’s, sauna), the barn (with dining room), a henhouse (with white Italians), a potato basement, and a Grillhouse (seats 12 people). There are several activities associated to the area. If you wonder what is included in the cabins, click here. We have also indicated what you might bring along. The Grillhouse is a popular spot at the evenings. There are room for about 15 people, and many hobby-philosophers have been attending discussions until early hours. The Yardhouse is located approx. 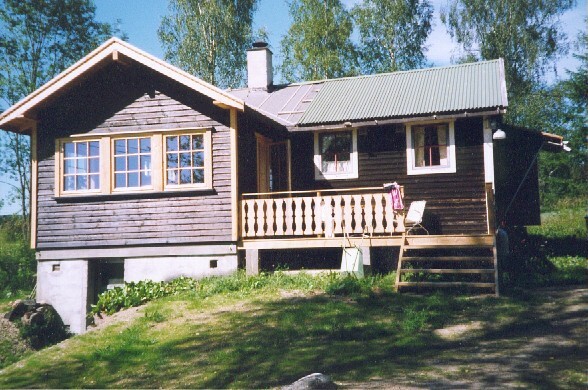 200 meter away from Solhaug - close to the beach and the forest. 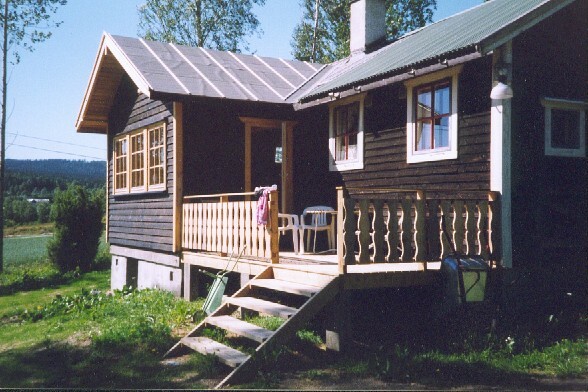 All the cabins are renovated during 1998 and 1999. We have installed water, electricity, fireplaces, dishwashers, saunas, and more bedrooms. The places have never been renter out before. The Storehouse and the Littlehouse are renovated according to their ancient inheritance; with lumber walls and 100 years old floors. These two houses where originally work buildings on the farm. 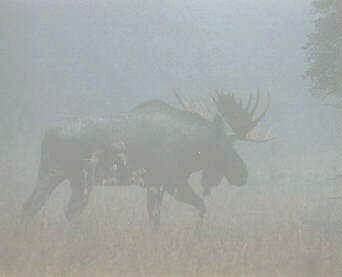 The Littlehouse was used to wash clothes, baking, slaughtering, and the hinds lived here. The Storehouse was first and foremost used to storing and preparation of food. The Yardhouse is a more traditional cabin because it is initially build as a vacation home. The total capacity for the cabins are approx. 30 people. The Storehouse is the smallest cabin, and it is placed southward. Its main floor consists of kitchen and a bedroom, and the first floor consists of a living room and two bedrooms. It is water (hot/cold) in the kitchen and electrictity. It is a nice terrace outside. The kitchen is equipped for six persons. There is a (little) dishwasher, refridgerator, (electric) cooker, and kitchen-table for six persons. There is a window directed westward. In the living room there is a fireplace, sofa, table and chairs. There are windows southward and northward. One of the bedrooms at the first floor is equipped with double bed. The other is equipped with a single bed pluss a guest bed. The main floor bedroom consist of one bunk bed pluss one single bed; i.e. a total of three beds. The room is also suitable as a playroom for kind. Total bed-capacity at the Storehouse is 6 + 1 persons. We must emphasize that the kitchen and living room are not large rooms. Five meters away from the Storehouse you find the Pumphouse which contains WC, showers, and sauna. is headed westward, but it is not “little”. It is actually the largest cabin. Main floor: Kitchen, a compartment (which is a multi-functional room), living room with a dining table, and a little closet/storeroom. The first floor: Two bedrooms. The compartment may also be used as a bedroom. There are water (warm/cold) and electricity. You find a little terrace, a lawn, and table/chairs outside the cabin. The kitchen is equiped for 8 persons. There are refridgerator, stove, and a kitchen table for approx. 8 persons. There are two windows (south and west). There is a large fireplace in the livingroom which was used for baking and washing clothes in ancient times. There are sofa and several chairs. The dining table seats approx. 8 persons. There are three windows in the living room. The living room is large. A stairway goes up to the bedrooms in from the living room (it is quite steep). Both bedrooms are equipped with families in mind: One bedroom has a double bed and four single beds, and the other has a double bed and two single beds. The single beds are wide; 120 cm. and may be used as double beds as well (for children?). The bedrooms have a capacity for 10 persons. The compartment may be used as living room and/or as a work room, and/or as a bedroom. This room is equipped with one comfortable bed, table and chairs. With the bed in the compartment room, there are beds for 11 persons. If the group is larger, another guest beds may be placed in the Littlehouse. We have to talk about this in advance. is a large southward cabin. The main floor: Kitchen, living room with dining table, two bedrooms, toilet (WC and wash tub). The basement: shower/changing-room, sauna, rest-room/staircase. There are enough space for cars outside the cabin. Good outdoor space. Approx. 100 meters to the beach and the boat. View to the lake. The kitchen is equipped for 10 persons. There are a (large) dishwasher, refridgerator, (electric) stove, cold/warm water. There is a window on the south wall. In the living room there is a fireplace (combined oven), sofa, chairs, and dining table for 8 persons. There are several windows southward and a door to the garden. One bedroom at the main floor are equipped with a double bed and a single bed (as bunk beds for three persons). The other is equipped with a bunk bed (two persons). There is a sleeping sofa in the living room for two persons and a single bed. This give a total of 8 beds. There are possible to increase the amount of beds by mattresses and portable beds. See pictures below. The view is from the cabin. What must I bring along...? If it is desired, we may do your beds and put up towels before you arrive. You must give us a hint about this when you order. Welcome to a relaxing time in the Finnforest ! !